I absolutely knew I was going to love it. oh man, Oh man, Oh Man, did I absolutely love this book! It was everything I needed, wanted, and more! I think I will be using a lot of exclamation points the entire review!!!! Let’s just start of by addressing the painful stuff first. Annie’s story about Kyle’s death and how it all went down was so sad…I was nearly in tears. I could imagine the guilt she felt. She was going to marry that guy. I seriously don’t know how she wasn’t a bigger mess. I think Kenneally did a wonderful job at explaining the importance of the marathon and Kyle to us, the readers, so that we could get it and understand why the marathon is so important to Annie. Oh Jere. I remember you in Things I Can’t Forget and oh man I’m glad you’ve changed. What I really liked about Jeremiah is how honest he was with Annie. Jeremiah is exactly what Annie needed, and Annie is exactly what Jeremiah needed. Even though Annie was getting over someone who died, which I think is probably harder than getting over someone who is alive, she is able to stand on her own two feet and call out Jere out in his crap. I also love that Jere was there for Annie and waited for her to be ready. A man who can respect a woman. I like that. We need more men to be like that. 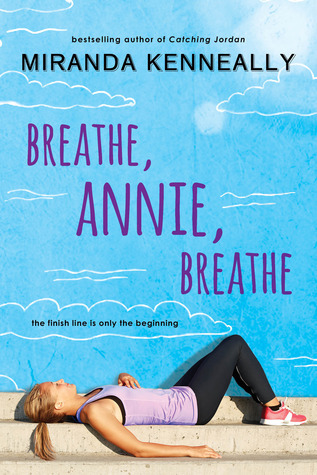 Breathe Annie Breathe didn’t just focus on Annie, but also addressed Jeremiah’s issue. I am a person that at times does somewhat risky things to get over a fear and likes to feel that rush of adrenaline that makes you feel like you’ve conquered the fear. I get why Jeremiah searched for that surge of adrenaline and how that road that led him to turning into an adrenaline junkie. He had to make some hard decisions throughout the entire book to change. The best part of each of the main characters were their interactions and how each could see through the other’s facade and actually address the issues and situations. Neither chickened out on each other. The only reason I am giving this 4.5 stars instead of 5 is that the few pages before the ending were a little… weird for me and I felt like the story abruptly stopped. That ending was so not an ending. Some of you might remember I had a few issues with Kenneally’s second book Stealing Parker for bad representation of certain groups of people, but I will say that I’ve loved every other books she’s written. So far I own all 5 Hundred Oaks books and hopefully I will keep owning more in the future. I’m not done with the Hundred Oaks world yet Kenneally, and I hope you aren’t either.